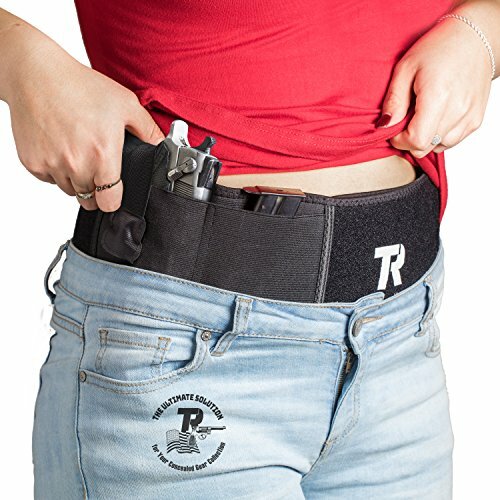 Tommy Raz concealed holsters are just perfect for the sidearm of your choice, 4"-8" in length (measuring tip-to-grip - from tip of gun muzzle to where it curves). Use with Glock, Springfield, Taurus, M&P Shield, Sig Sauer, Bersa, Ruger, Kahr, Walther, Beretta, Kel Tec, Rock Island, Kimber, S&W SD9VE, and more. The belly band holster is made of breathable, cool Neoprene Plus material that stretches comfortably across your body. The soft, absorbent 100% cotton lining prevents increased perspiration, skin irritation and itching. This means that you can wear your holster directly on your body and experience ultimate wearing comfort previously unknown with traditional holsters. The button nonetheless unsnaps easily and soundlessly for perfect quick-draw performance! These concealed carry holsters can be worn every which way - concealed or over shirt, inside/outside waistband, appendix position. In the small of your back, behind your hip ("5 o'clock position"), cross body, or as a shoulder holster. The great design right on target whether you wear yoga pants, gym/running shorts, sweat pants, jeans, dress or skirt - with belt or without, with waistband or not. NOW. With a 30-day guarantee, we've got you covered! It's your complete satisfaction - or your money back! Special launch price for a limited time! ✅ BELLYBAND HOLSTER SNAPS WEAPON IN SECURELY & UNSNAPS FAST for silent quick draw action! ✅COOL ANTI-SWEAT COMFORT with breathable stretchy Neoprene Plus material and 100% cotton lining. ✅ VERSATILE DESIGN FOR WEARING inside/outside waistband, cross body, appendix, hip/ shoulder & more. ✅ACCOMMODATES ALL CLOTHING with/without belt or waistband, yoga pants, gym shorts, dresses/skirts. If you have any questions about this product by tommy raz, contact us by completing and submitting the form below. If you are looking for a specif part number, please include it with your message.